The day for which thousands of Sai youths from Maharashtra and Goa were awaiting for more than a year finally arrived. On 3rd of January 2008, about 3000 youths all over from Maharashtra, which also compromised 180 Sai brothers and 75 Sai sisters from Goa gathered at the sacred abode of Swami: Puttaparthi. Every acquaintance greeted each other with Sairam and smiles. It was yet another special event in puttaparthi for which all had gathered. It was not Seva, not even Ashadi, but the Maharashtra and Goa youth Conference from 4th to 6th of January. Days and nights were spent in singing bhajans, sharing instructions and practicing the plays, dances and songs. Each Brother was provided with a saffron scarf and identity card while Sai sisters had selected a special type of saree as their uniform. All the instructions were by hearted and performances had neared to perfection. It was also decided that all the programs would be held in the evening. 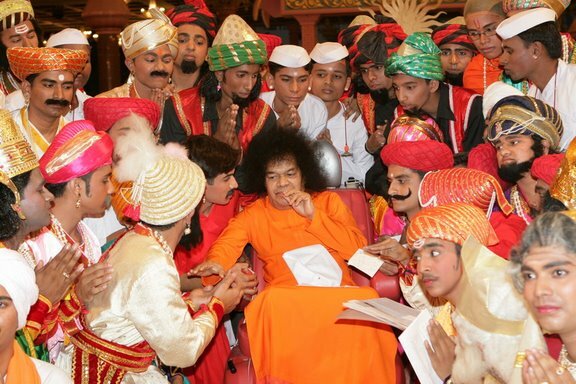 With Swami’s name in their lips, the Sai youths prayed for a fruitful pilgrimage towards divinity. The auspicious day dawned. By 3:00 p.m. everyone was fresh and ready with the Vibhuti tilak on their forehead. Seeking permission from the All Maharashtra and Goa president and youth coordinators, the infinite streams of Sai youths steadily rushed towards the Sai Kulwant hall where a special place were arranged for them. The Sai youths seemed like ants of same colour. They were the ants infected with Sai bhakti and desperate to carry the sugar of divine love from swami. All the Sai youths sat silently chanting the name of Sai. After hours of waiting, the sacred mahuratha arrived. As Omkar began reverberating in the hall, Swami was seen coming inside his pleasantly smiling at the devotees. Coming onstage after a round of the Hall, Swami called the coordinators of the Sai Youth Maharashtra and Goa and interacted with them about their program for today. The youths came to Swami in pairs and sought his blessings. As Swami declared the program to start the procession of Sai youths who had gathered at the gates of Sai kulwant hall slowly came in. The procession was divided into groups, each consisting five individuals and the first youth of each group held a banner that told the name of their respective districts. This was followed by a tradition Adivasi dance by Gadchirolli district of Maharashtra called as ‘Dance of gratitude’. The Adivasi youth dancers were clad with mango leaves and colorful streamers. This dance is performed in the rural parts of Maharashtra as a thanks giving to gods. Every one glued their eyes at them till the very end. After the dance swami called them near and interacted with them for sometime. 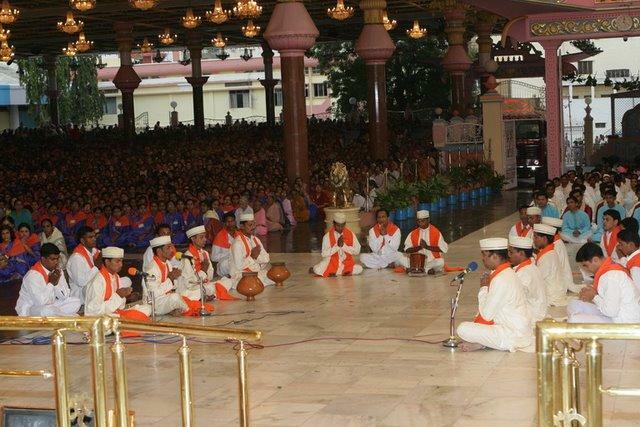 After the tradition dance, the Sai youths of Goa performed ‘Ghumath Aarti’ Goa’s ancestral melody bhajan. The participating youths wore the traditional Goan dress and came with their musical instruments like drums, taals and ‘Ghumaths’. As the Ghumath Aarti started, the melodious tunes from the antique and outdated instruments thrilled all the spectators and they heard the refreshing concert in awe. they swung their heads like pendulum with the tones of the music and no one expected the half-an-hour concert to finish up so quickly. 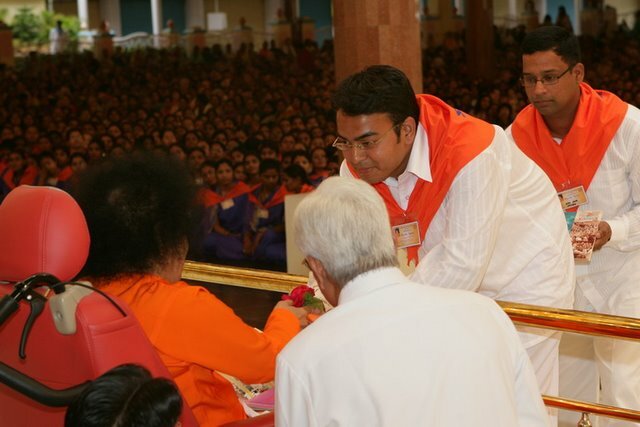 Swami was in all smiles and enjoyed the every bit of the Ghumath Aarti. 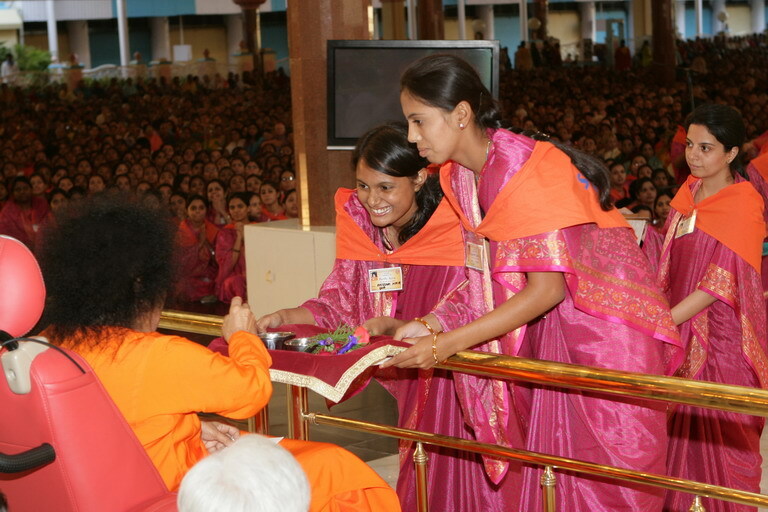 At the end bhajans were sung by Sai youths, Swami blessed the prasadam which was distributed to all. After few regular bhajans Swami returned to His residence after accepting Arati from the Youth Coordinators of Maharashtra and Goa. The last day of the unprecedented pilgrimage was yet the most memorable one. In the evening Sai Youth from Maharashtra presented a drama on Chhatrapati Shivaji in the Sai Kulwant Hall. 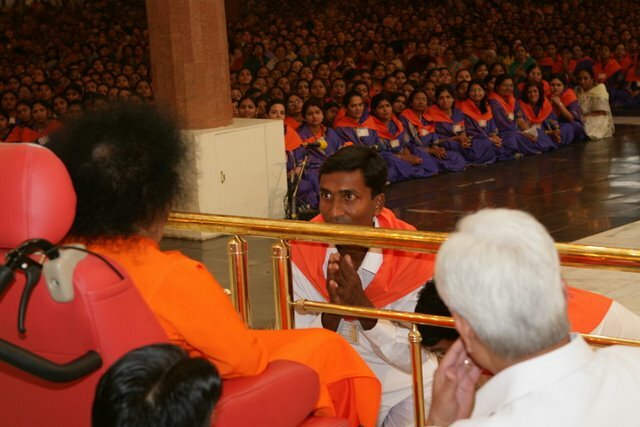 Swami finished His darshan round in the car and arrived onstage after speaking for a few minutes to the Warden of the Brindavan campus of the Sri Sathya Sai University. The forty-five minute drama began at 5.30 pm and presented Shivaji as an ideal youth leader, depicting his love of Mother, Motherland and cultural values. The drama showed how Shivaji was brought up by his mother, how he pledged to free his country and how under the guidance of his guru, Saint Ramdas reached the ultimate glory of being called as the emperor Shivaji. So happy was Swami that he came down from the stage to grant group photos for the participants while prasadam was distributed before moving to the interview room. A few minutes later, He came out of the interview room, accepted Arati onstage and blessed one of the participants with a chain before returning to His residence. With this the pilgrimage of the Sai youths of Maharashtra and Goa came. All the youths sang the glory of the Lord from the depth of the hearts, praising swami for his unending shower of love and prosperity. No one knew how the days passed by. Everyone wanted the event to go on infinitely, but alas no one except Swami himself can hold the time. Greeting Sai Ram to one and all every Sai youth departed to their home. But this is not the end. Each Sai brother and sister shall go not alone, but with the grace of Swami. They shall see Sai in all his kin, friends and enemies. They shall sing Sai Baba’s glory day and night. They immerse others in the ocean of devotion. They shall follow His instruction and lead themselves and others towards liberation. They shall attract and gather more Sai youths and increase Sai Family, and thus attain punya by contributing to Swami’s Mission of spreading Love and peace. Swami! We shall come again with more and more Sai brothers and Sai Sisters. We are waiting for your call! Swami, bless us thus that our eyes may see only you, ears listen only to you and mouth sing only for you.